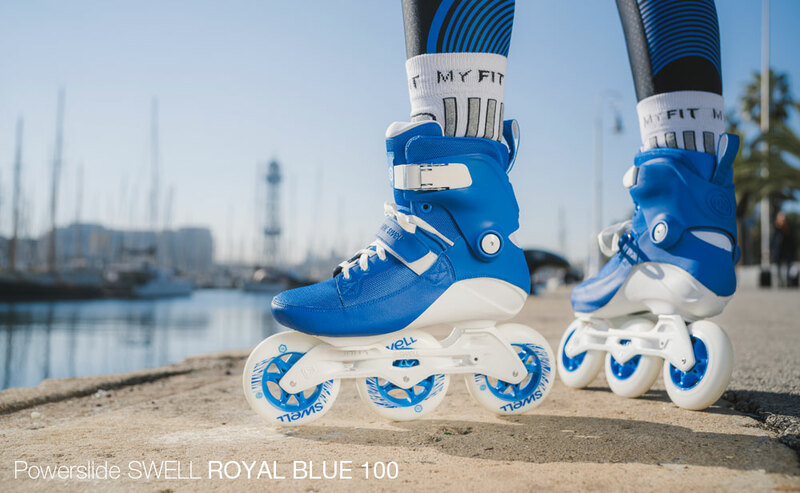 To deliver a real fitness skating experience we knew we had to innovate in every level, so we started from scratch. From the inside out every compound has been meticulously redesigned to improve the comfort and maximize the performance. 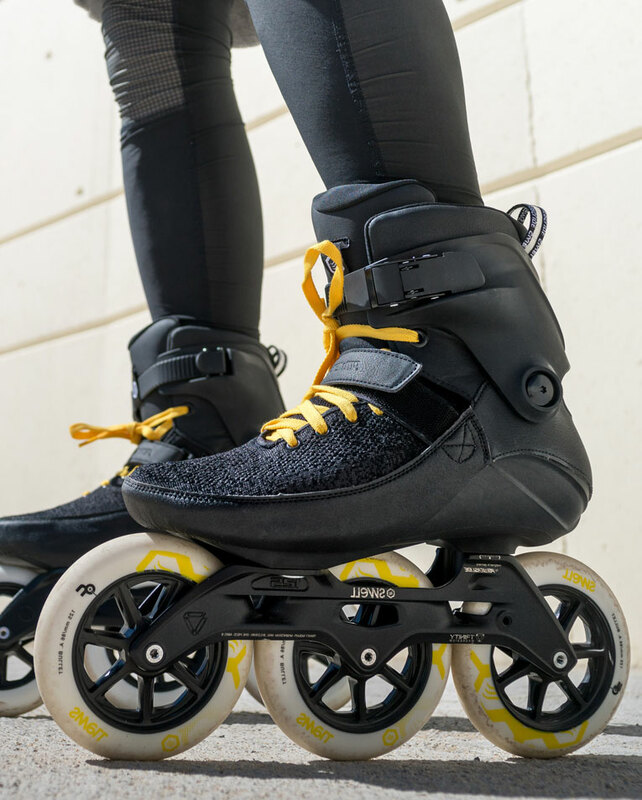 By including only the most essential elements, we created a sophisticated and minimalistic skate yet more efficient and advanced than any other skate available in the fitness segment, bringing some technologies accessible before only to an elite of professional speed skaters. 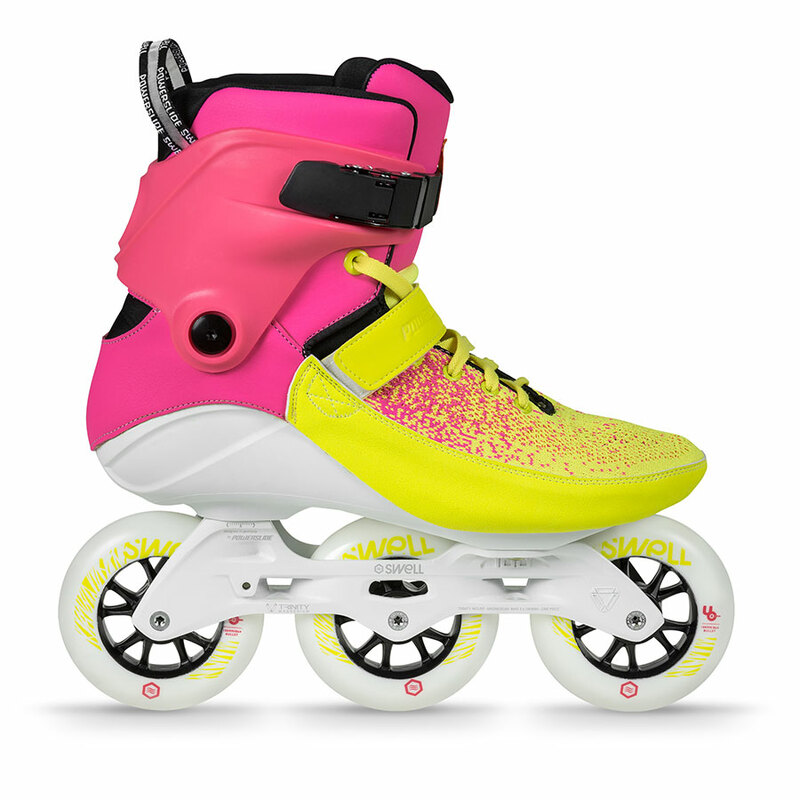 With the Powerslide SWELL collection it comes a whole new way to experience inline skating. It doesn’t only score with its extraordinary design, but also with perfect and comfortable fitting. The Swell skates are made for fast and intense skating and they will help you unleash your full potential, no matter if you skate for 5km or 42km, in perfectly paved tracks and rinks or in the city streets, you will experience skating as you never did before. 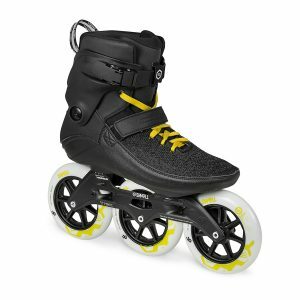 Does INLINE SKATING offer a GOOD WORKOUT? Many studies point to inline skating as the Nº1 calorie burning activity. 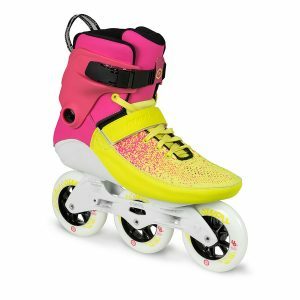 With the current boom of fitness culture, the growing popularity of outdoor sports and sportswear, as well as new healthy food trends, it’s about time people embrace the fact that inline skating has returned as the best thing to stay fit. 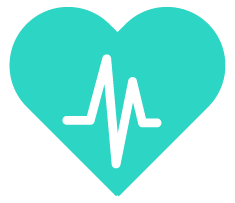 FITNESS SKATING is one of the best full body workouts you can get. It helps to perfectly shape your body by strengthening your legs and back, with low impact on the joints. 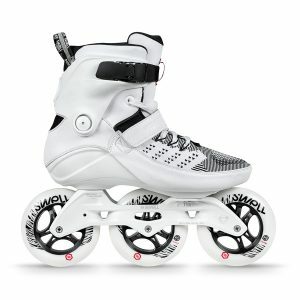 Skating is not only more fun than the gym, but more exciting and less harmful for the knees than running and a more complete exercise than cycling, and the best part is it’s really fun, you will actually enjoy every single minute of your workout. 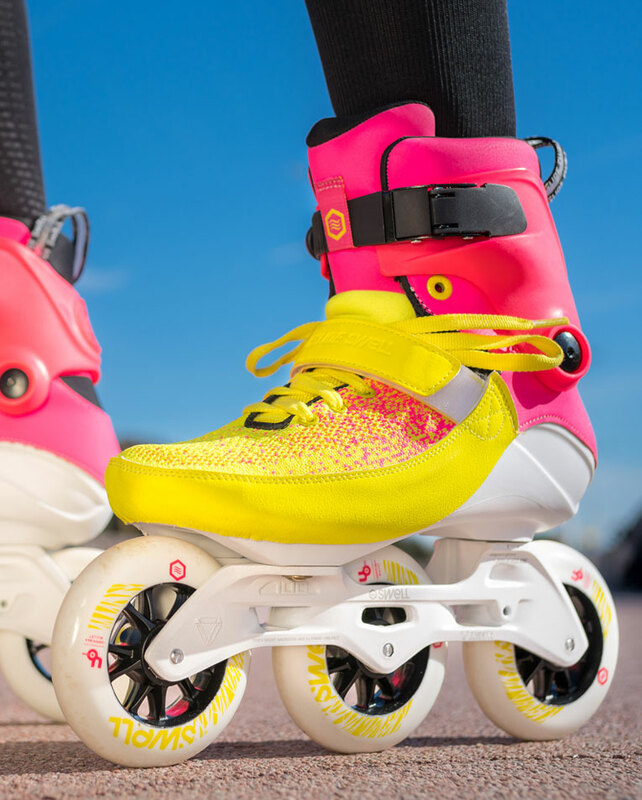 Inline skating, when compared to running, causes less than 50 percent of the impact shock to joints and the side-to-side movement required for inline skating results in a better muscle building workout than running. 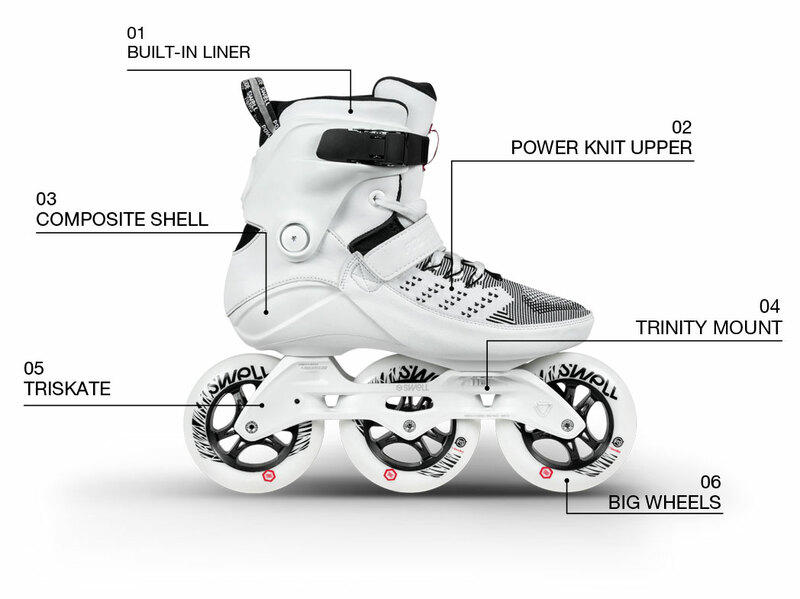 The skates are built in a unique and revolutionary manufacturing process. 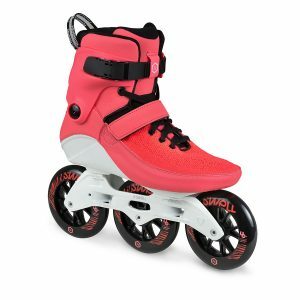 Powerslide SWELL skates come with a built-in liner which makes it the ultimate soft boot skate, providing unparalleled fit as well as being extremely comfortable and responsive. For first time in a skate we are using a seamless Power knit sock-like upper in four of our models. This makes the boot extremely comfortable, resistant, breathable and lightweight. 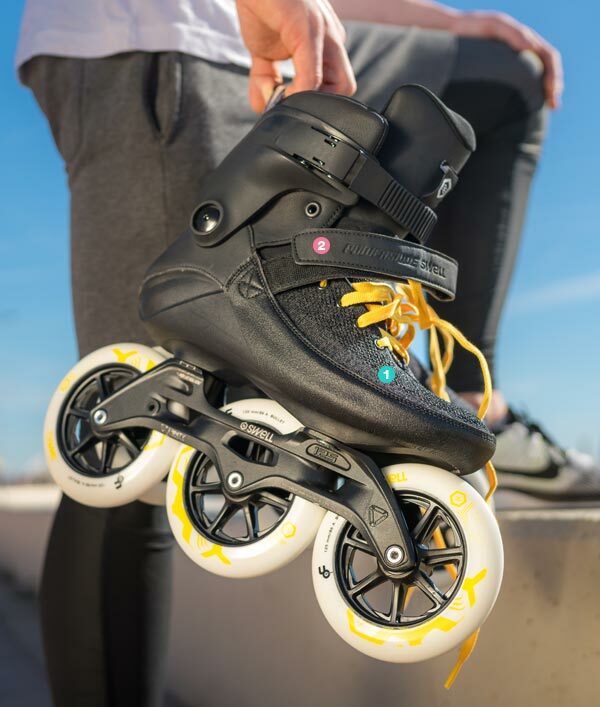 All the Powerslide SWELL skates include our new patented 3-point mounting system specially designed to take 3-wheel skates to the next level of performance. 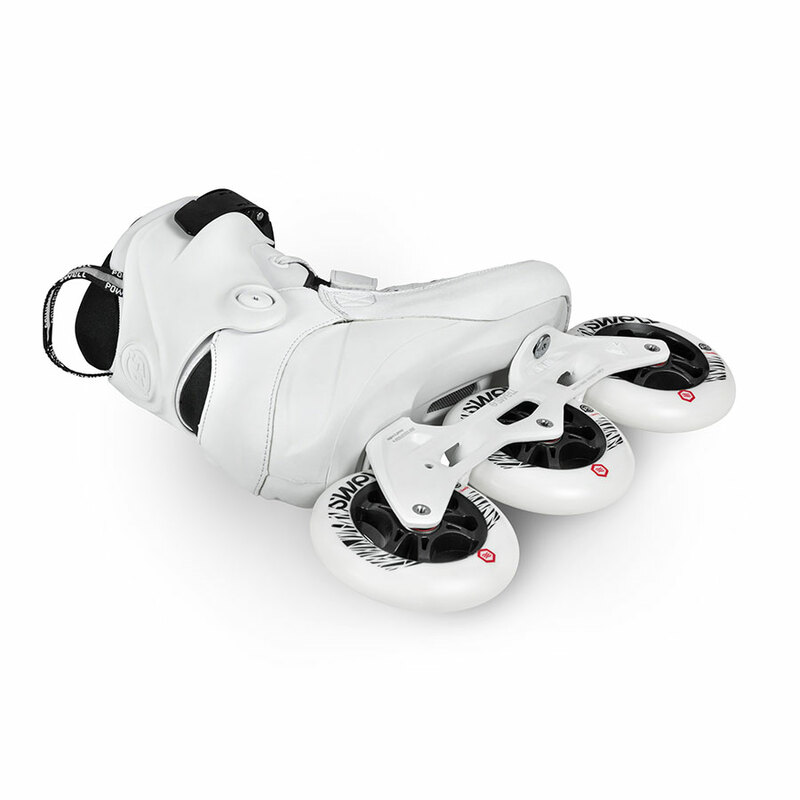 To reduce weight, improve stability, maneuverability, increase both speed and control as well as to maximize every skating stride, all the Powerslide SWELL skates are TRISKATES (3 wheel skates) which is the future of inline skating. 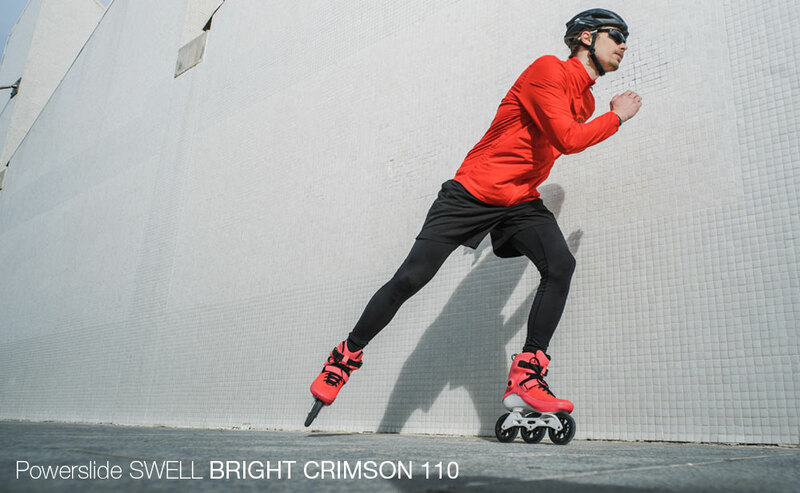 100, 110 and 125mm wheels provide a smooth ride over any surface. We have developed a special PU formula for all Powerslide SWELL wheels to guarantee high durability, unparalleled grip and maximum speed. The power comes from the inside. The inner shell is probably the most remarkable component in the Powerslide SWELL skates, it does work not only as the base that connects and supports the whole boot but its precisely engineered shape keeps your heel locked-in and improves your stability right from the bottom. We used a special nylon composite with glass-fiber mixed into the material, resulting in a light yet exceptionally strong and supportive structure that can’t be achieved with ordinary plastics. The bottom of the shell incorporates our unique cross ribs design to guarantee torsion stiffness and perfect power transfer for each stride. 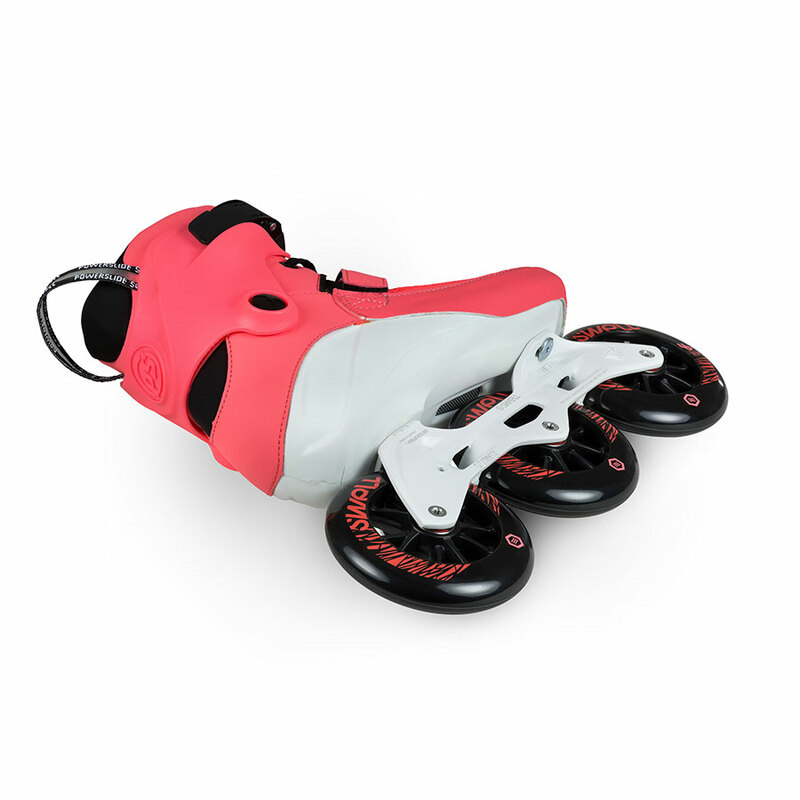 Unlike ordinary fitness skates our shells are perfectly shaped and anatomically engineered for left and right feet in order to create a better fitting and performance of the skate, resulting in an extremely comfortable and responsive boot. The same skate you love, but now more comfy. 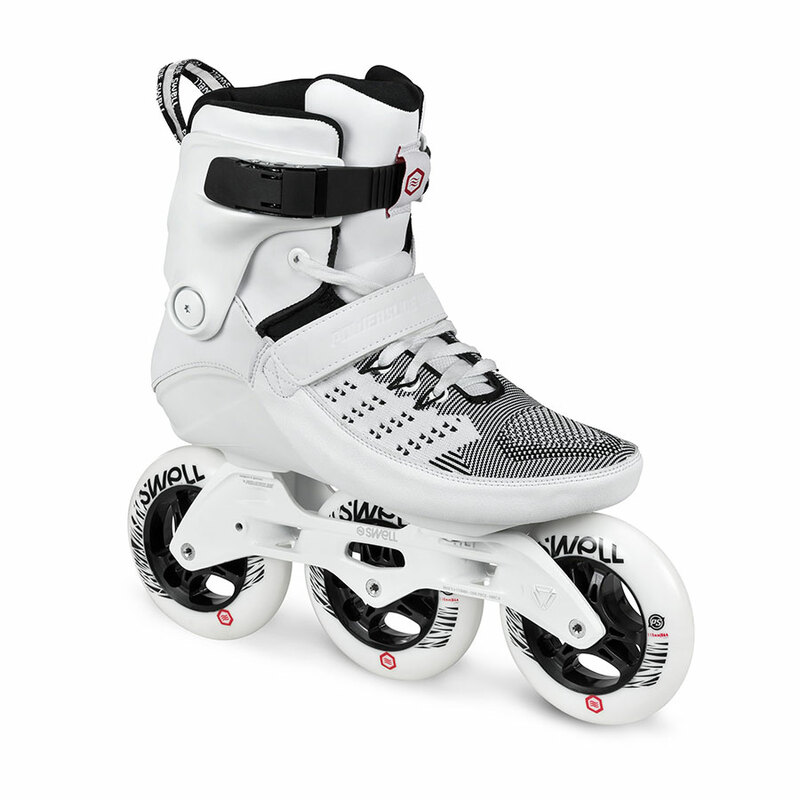 All the Powerslide SWELL series 3 skates include a redesigned shell with flex cuts, a unique technology developed by Powerslide to maximize the comfort without compromising the performance. 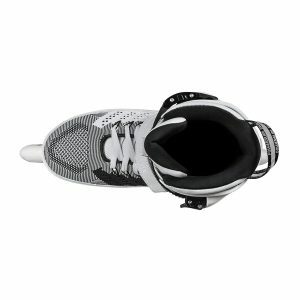 The new shell adapts itself to the shape of your ankle providing a more pleasant fit, flexing where you need it to and still providing the same amount of support and performance you would expect from Powerslide SWELL. 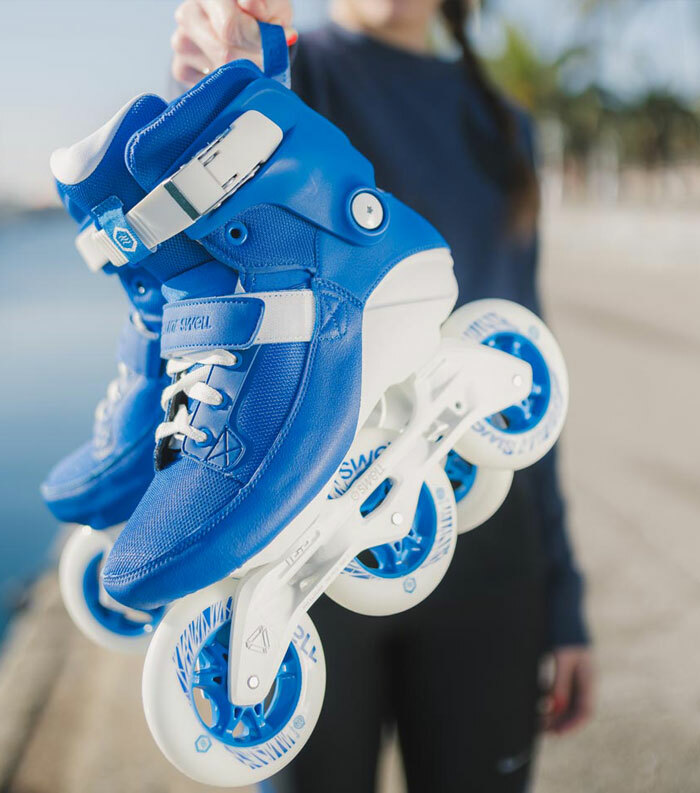 It means our skates are not only more comfortable than ever but they are designed to stay that way, providing the same pleasant fit either if you skate a few minutes or for hours. A simple cuff with unmatchable performance. 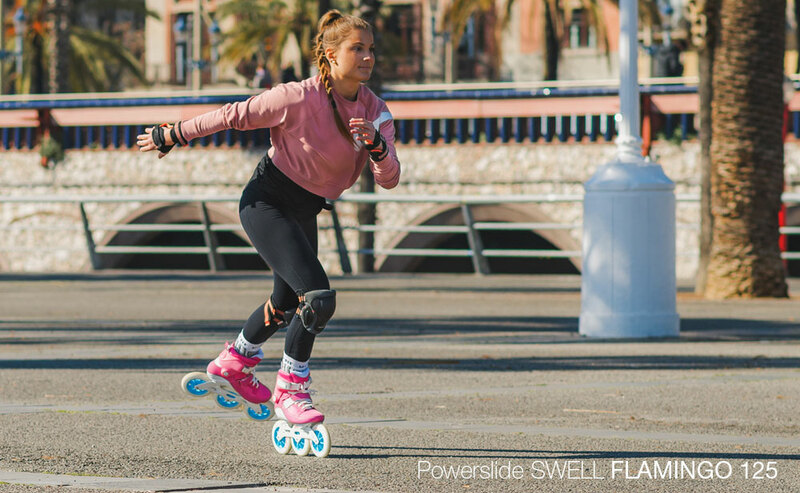 The next generation of Powerslide cuffs are sleek and light but very supportive, with solid lateral support and the right amount of front and forward flex. The cuffs are made out of a special nylon composite with added glass-fiber to meet the requirements of stiffness and repeated flex necessary for intense fitness skating. The asymmetrically design of the cuff paired with the v-cut shape in the back, works as the perfect extension of the shell and adds further strength to the construction. 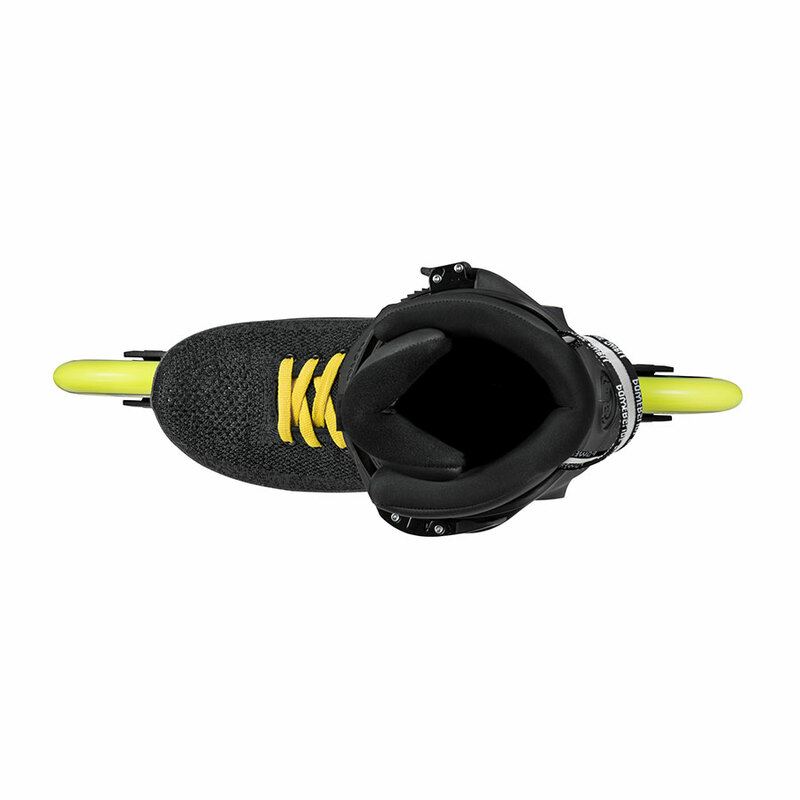 We included our extensively probed top buckle, a trustful and effective fast lock buckle with a new female buckle receptor that sets a new standard in boots closure systems. 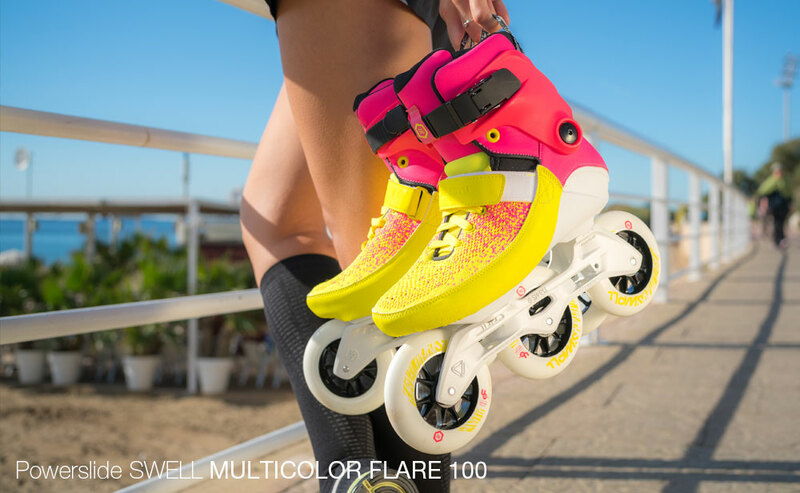 Powerslide is the first company integrating a Power knit woven upper into an inline skate. 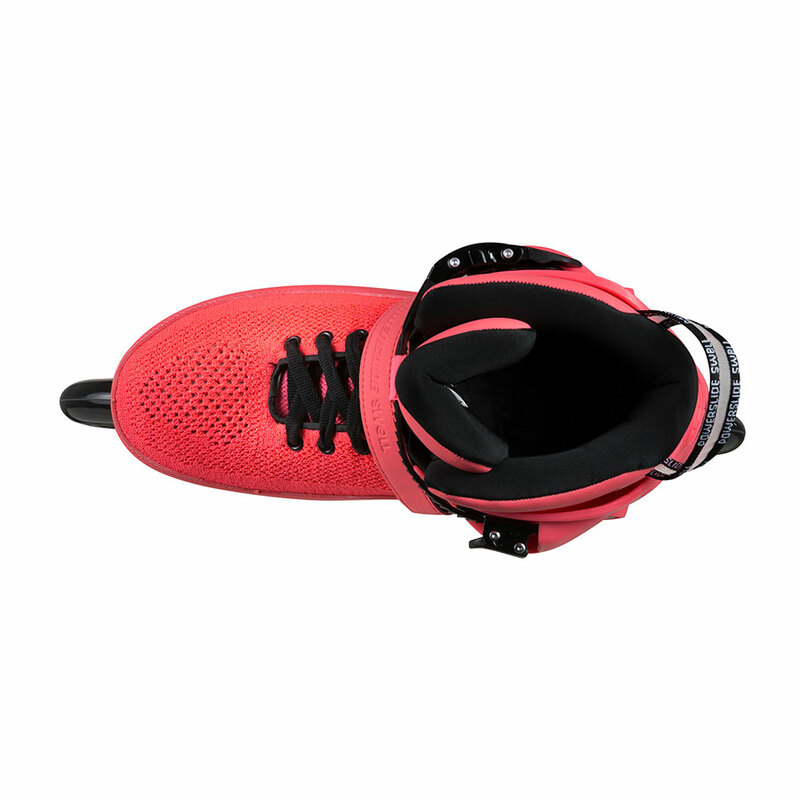 This ultra light and breathable high performance material reduces weight and adapts to different foot shapes wrapping seamlessly around your foot like a flexible second skin. 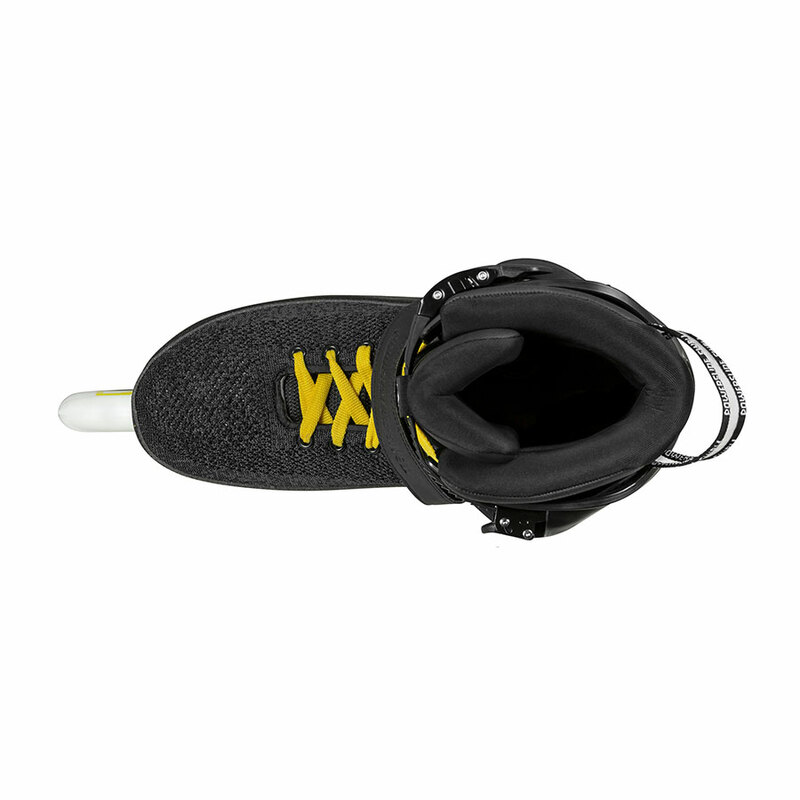 The strong heavy waxed and flat laces are connected to metal eyelets to transfer all the pulling power and keep your foot always locked in the right place without any pressure points. The Powerslide SWELL generation 3 skate include our new power knit pattern with yarns and fabric variations engineered for a precise fit with zonal support and extra ventilation, resulting in the first Inline skate that truly breathes. 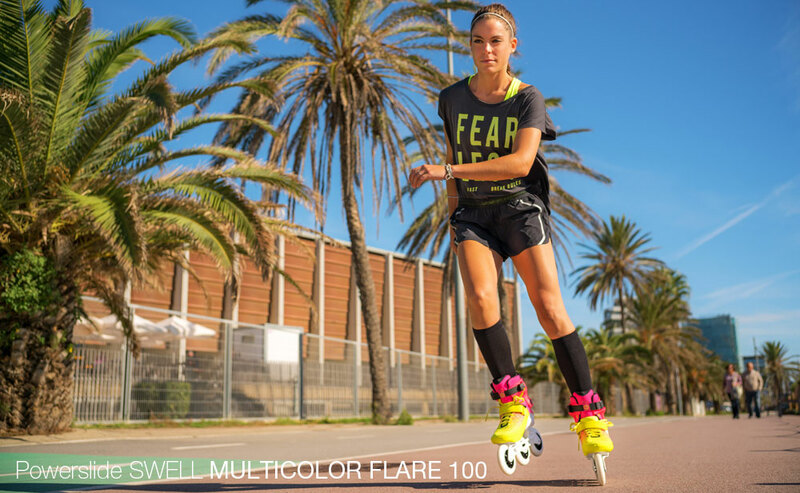 Models with Power knit upper: Black 125 City, Black 125 Road, Ultra White 110, Bright Crimson 110, Multicolor Flare 100. 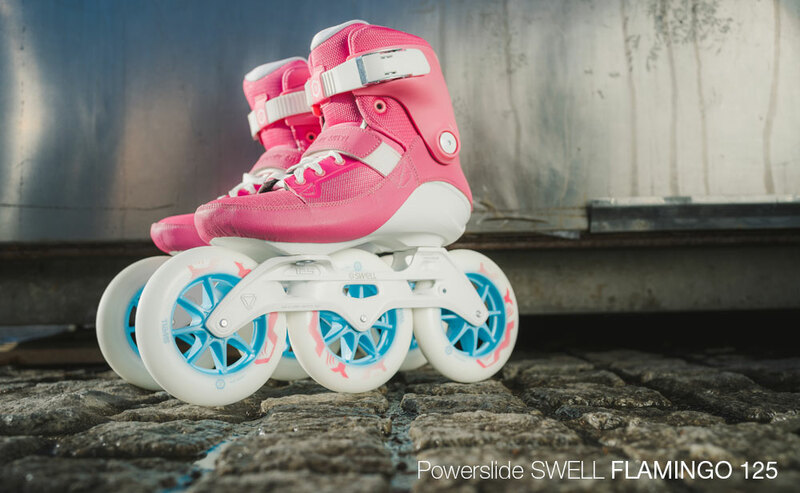 Powerslide is integrating the seamless welding technology into an inline skate. The ultra-light and breathable nylon mesh reduces weight and adapts to different foot shapes wrapping seamlessly around your foot like a flexible second skin. 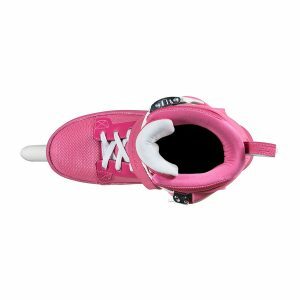 The strong heavy waxed and flat laces transfer the power to the lacing area, smoothly welded by heat to the mesh without any stitching or extra layer, keeping your foot always locked in the right place without any pressure points. Thanks to our integrated 45º powerstrap we solved the so common heel-lifting problem resulting in a perfect power transfer and advanced skate feeling. 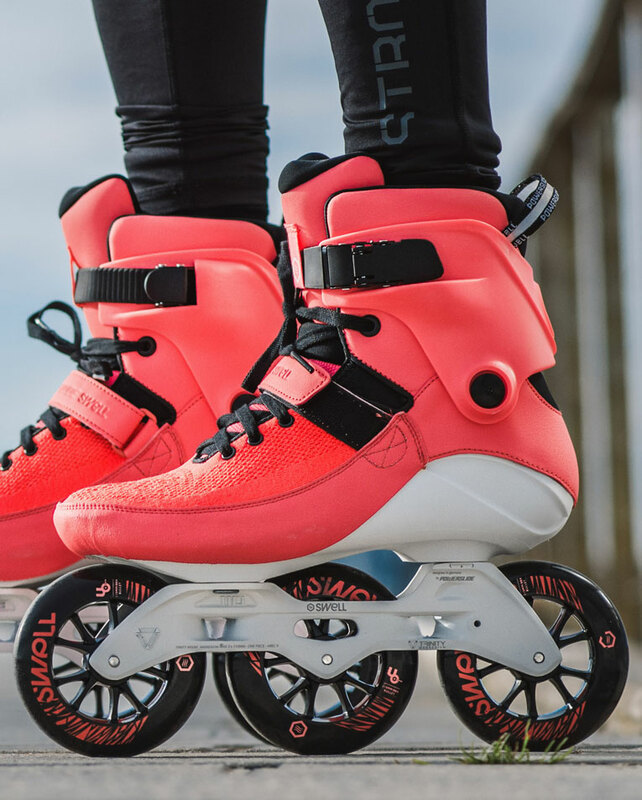 As with all things you wear, choosing your pair of skates is very personal and we offer a wide range of distinctive styles for everyone’s taste. The nice finish in details along with the rich and vivid colors round up the Powerslide SWELL collection. 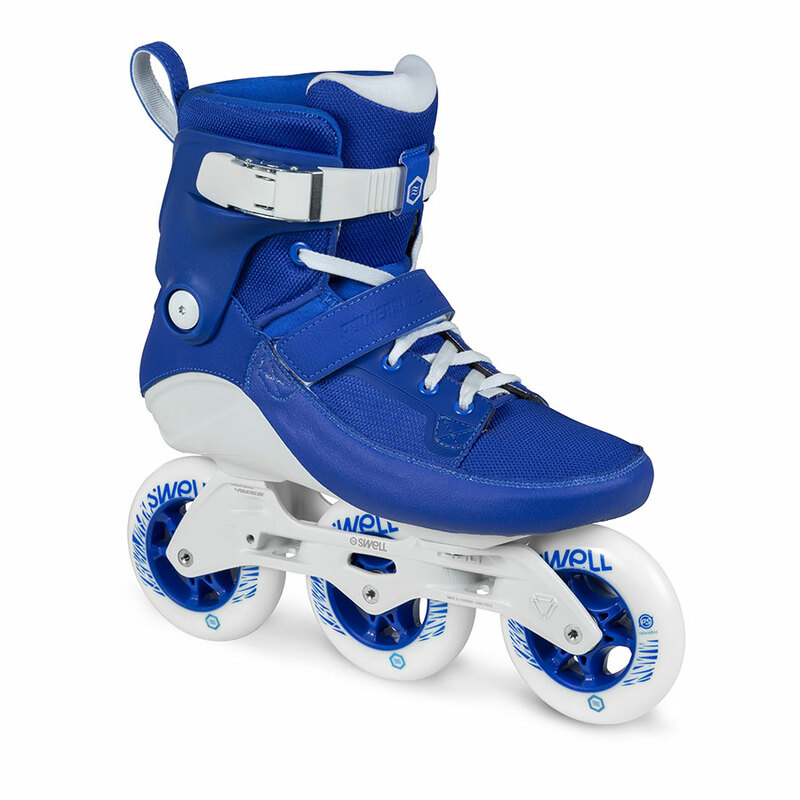 Models with welding upper: Flamingo 125, Royal Blue 100. 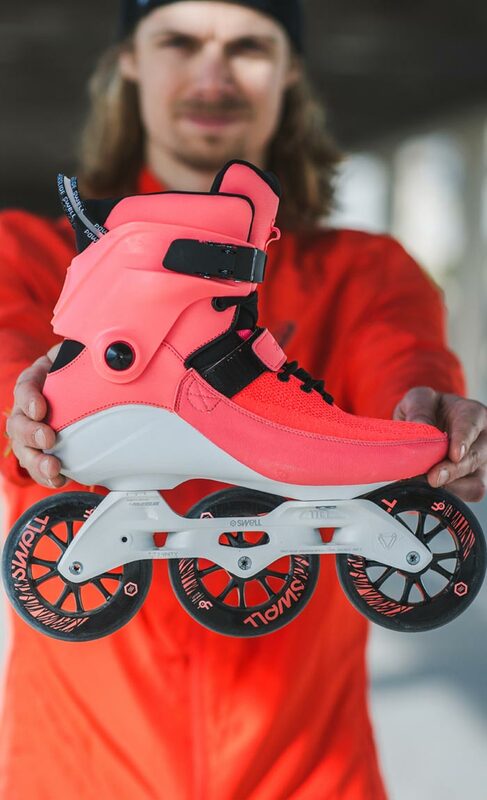 Thanks to our integrated 45º power strap we solved the so common heel-lifting problem resulting in a perfect power transfer and an advanced skate feeling. Just the right amount of padding, right where you want it. One of the biggest challenges we faced was how to integrate the shell with the upper and the inner padding. 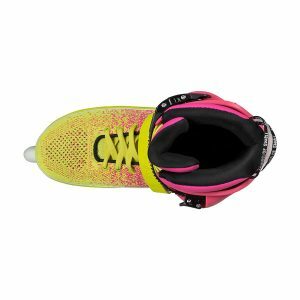 It was not possible to achieve the level of responsiveness we were looking for with a traditional hardshell and a removable liner construction so we developed a new manufacturing process to combine the technology used in high quality speed racing skates with our unique power knit upper/welding upper. The result is a simple, one piece construction, with a smooth join between outside and inside, upper and lining. The Powerslide SWELL skate is not fully a hardboot nor a softboot skate and still it has the best of both worlds. 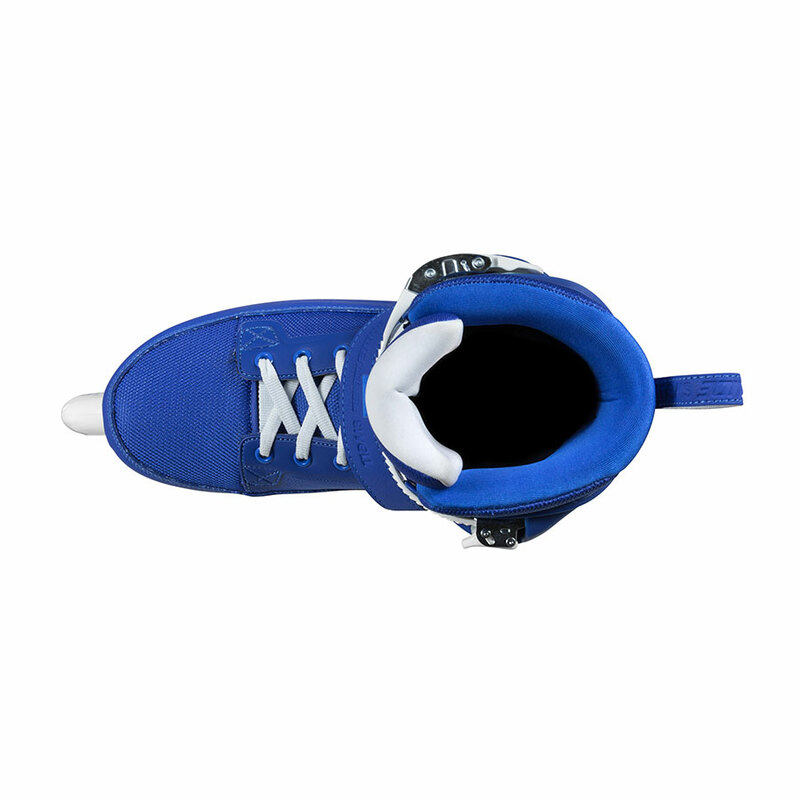 The ankle padding for SWELL skates was designed with comfort as the main objective. In order to endure short intense trainings but also to allow you to wear your skates for a longer period of time. 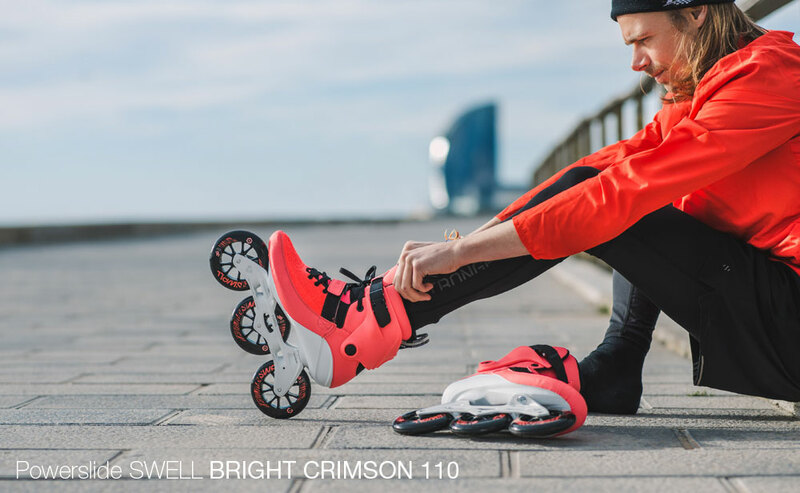 All the Powerslide SWELL Series 3 skates feel great from the very first moment you put them on thanks to the new RECALL fit, a 3-D anatomically shaped padding made out of a special memory foam, offering the same great comfort and performance day after day. Why skate something that gets in the way to achieve your goals? 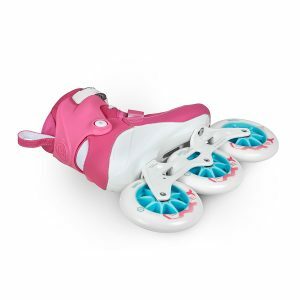 Forget about stinky and puffy liners that result in unresponsive and floppy skates. 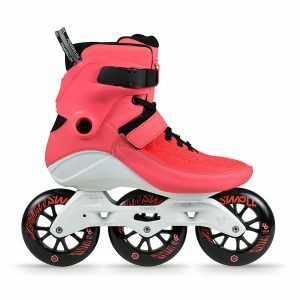 The Powerslide SWELL skates will give you that extra boost when you need it the most but also provide a painless and comfortable fit for those long distance skating days. Go further, harder and repeat. 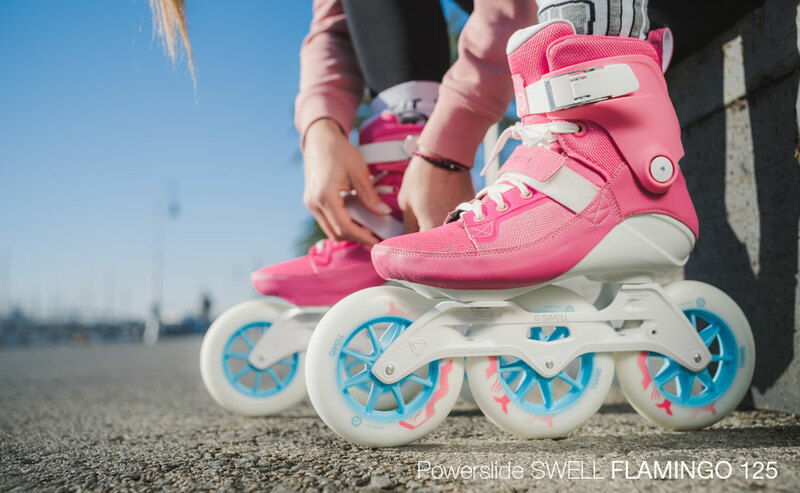 The Powerslide SWELL skates help you perform your weekly training and still enjoy every single moment you are in your skates. When less means more, way more. 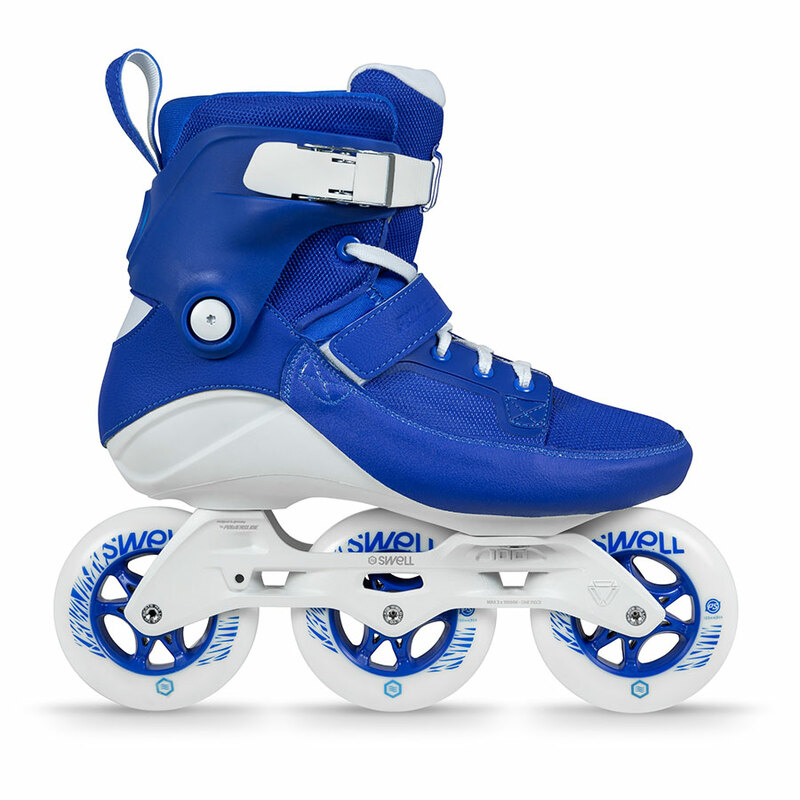 The Powerslide 3 wheeled frames are a decisive unique feature to all Powerslide SWELL skates. Three big wheels offer a bigger footprint with more PU in contact with the ground and more response out of the corners. So that’s why less wheels mean more grip. Also three wheel frames can be lower and shorter than 4 wheel frames with smaller wheels, making it easy to maneuver and control your stride. With the center wheel right under the center of gravity, turns are easier and the whole skating experience feels more natural. 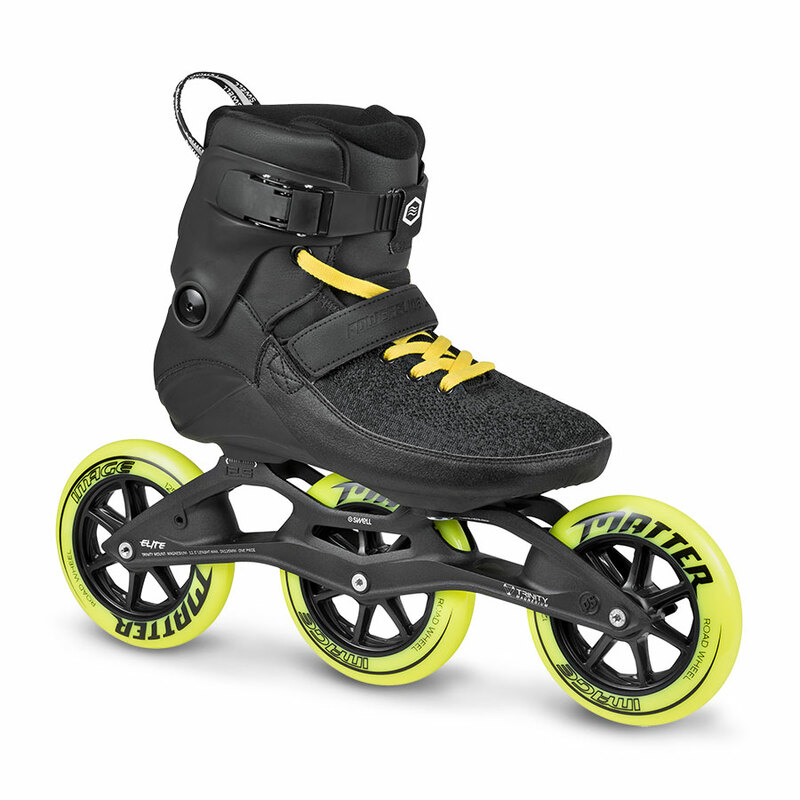 All these features make it easier to adopt a proper skating habit and help you learn advanced techniques such as the double push. 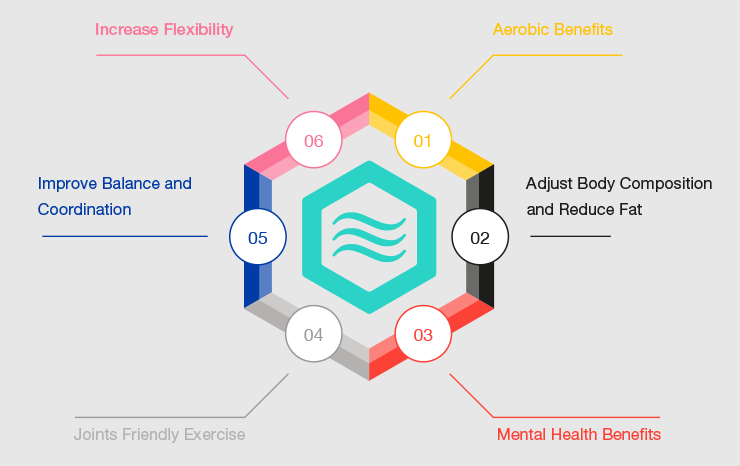 An additional benefit is the lower weight which makes skating more fun and less energy consuming, allowing to skate for a longer time and improving your endurance. 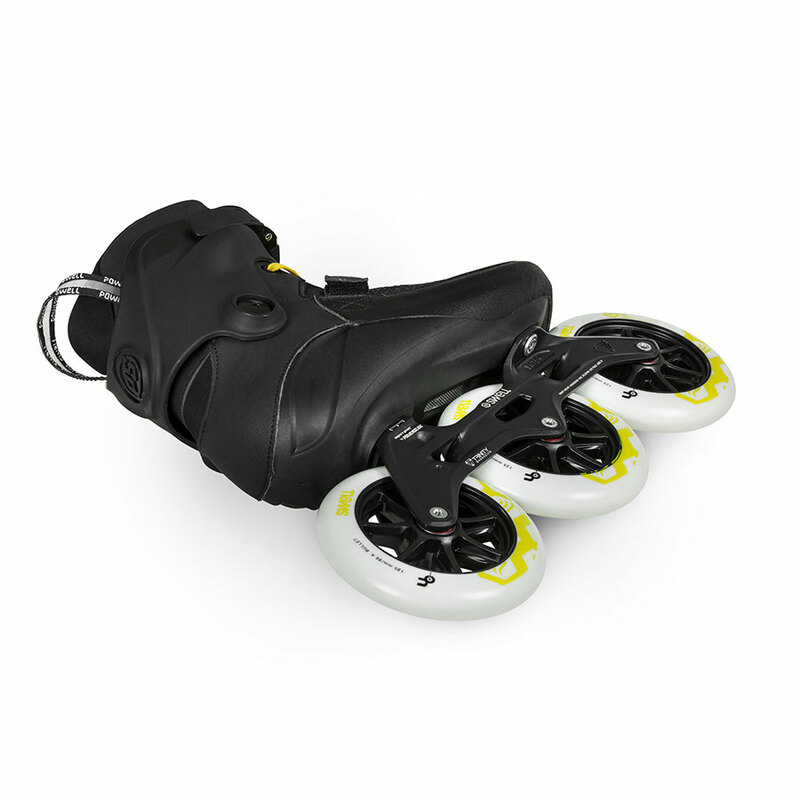 The Super skate, now with TRINITY mounting. Say hello to the best frame mounting system: TRINITY. 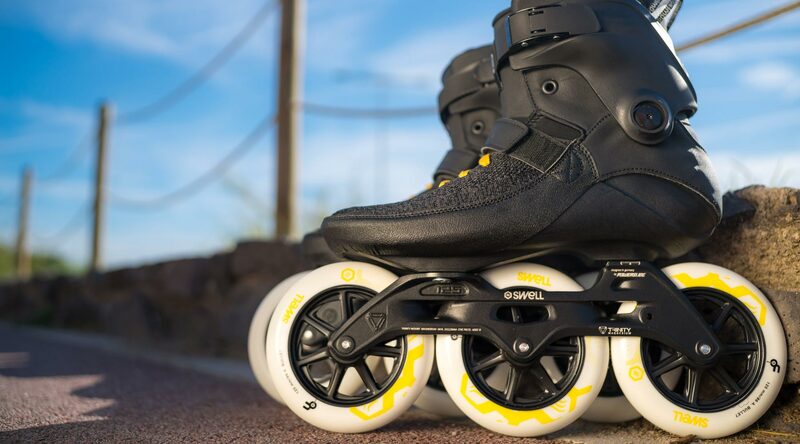 All the Powerslide SWELL skates include our new patented 3-point mounting system specially designed to take 3-wheel skates to the next level of performance. The three points of fixation with asymmetrical wings in the front puts incredible power under your feet, overtaking any other 3-wheel frame in the market. Skating with three wheels feels more responsive, more pleasant and more natural than ever. More sensitive and easier control of the boot. 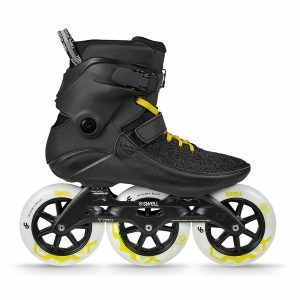 Ideal for long distance skating. The most powerful wheels ever in a fitness skate. UC wheels are made in USA by Matter, the world leader in race wheel technology using only the best possible materials. 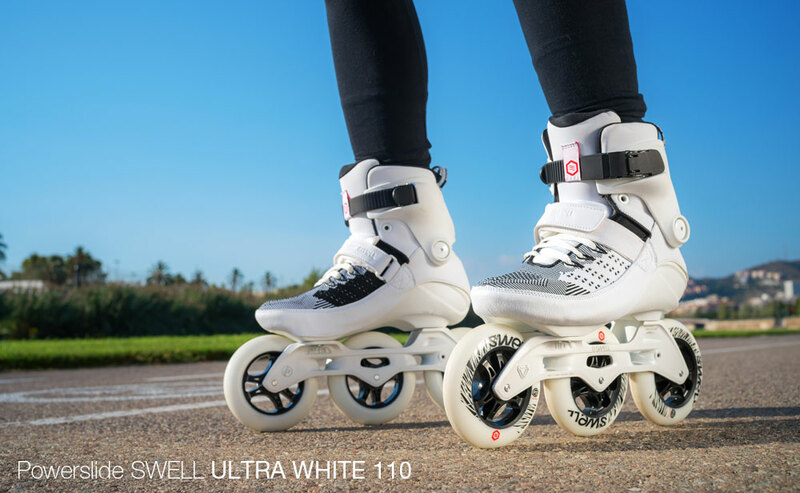 UC by Matter wheels are not only faster but also provide maximum rebound, grip and power transfer and yet, they offer unprecedented durability. 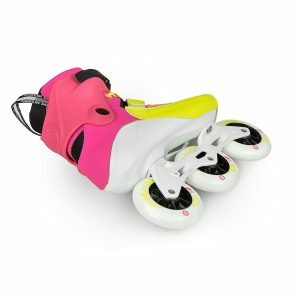 UC by Matter wheels enhances our skates to leap past any other fitness skate, pushing the boundaries of traditional fitness skating with a new level of responsiveness and performance only seen before in the professional racing tracks. The most advanced wheel in the planet. Matter® is the undeniable world leader in race wheel technology. 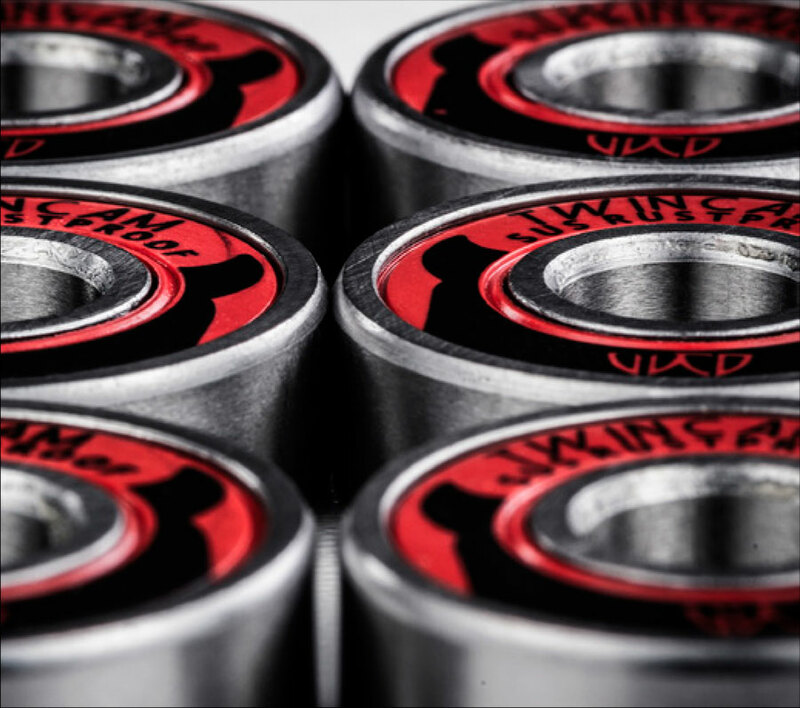 All Matter wheels are poured in the USA using only the finest possible materials. Matter enhances you to skate faster, provide exceptional rebound, grip and power transfer and yet, they offer unprecedented durability resulting in the perfect choice for long distance skating and marathons. 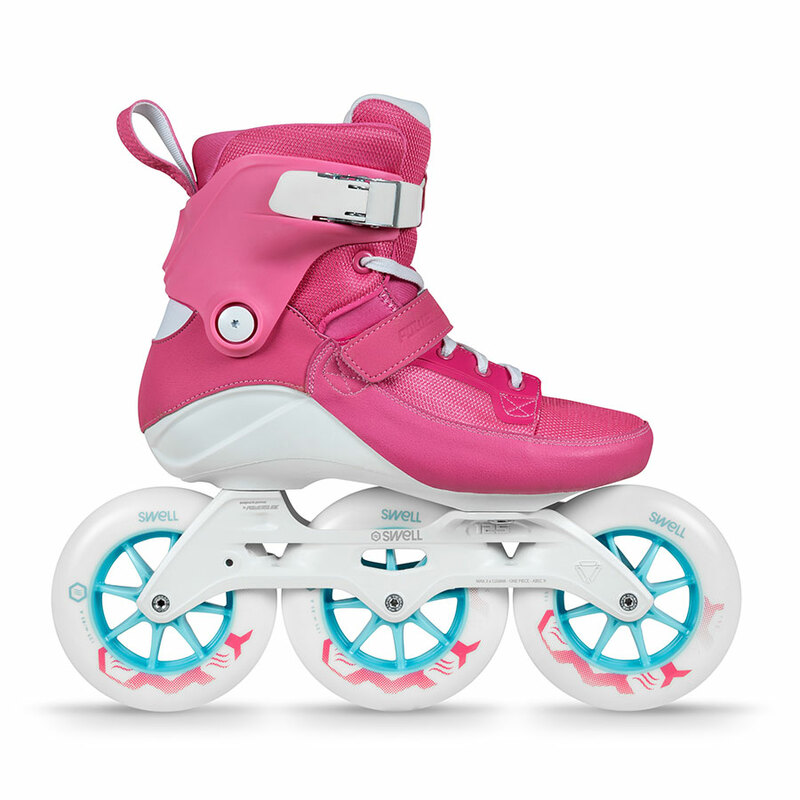 For first time we offer a level of performance in a fitness skates. The perfect balance of speed, grip and rebound. 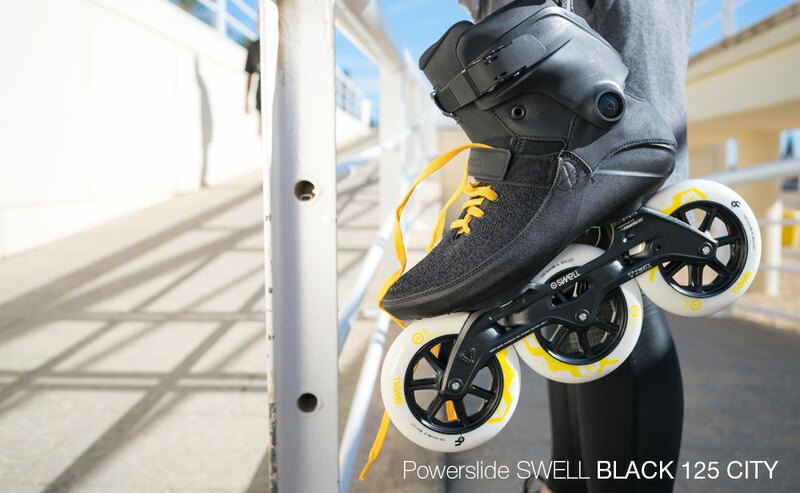 We have developed a special PU formula for all Powerslide SWELL wheels to guarantee high durability, unparalleled grip and maximum speed. The core with solid spokes transfers all the power from your legs to the ground providing an excellent push and stride. There is the right amount of PU over the hub to take away shocks and vibrations of the roads, but thanks to the long lasting and super high rebound urethane, these wheels are a great choice for fast pacing and also for long distance skating. 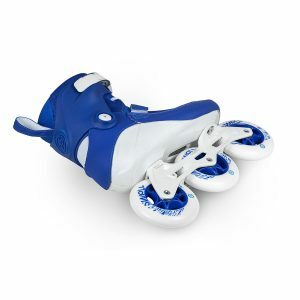 One of the main benefits of Triskates over 4 wheel skates is they allow for a bigger size of wheels: 100, 110 and 125 mm. 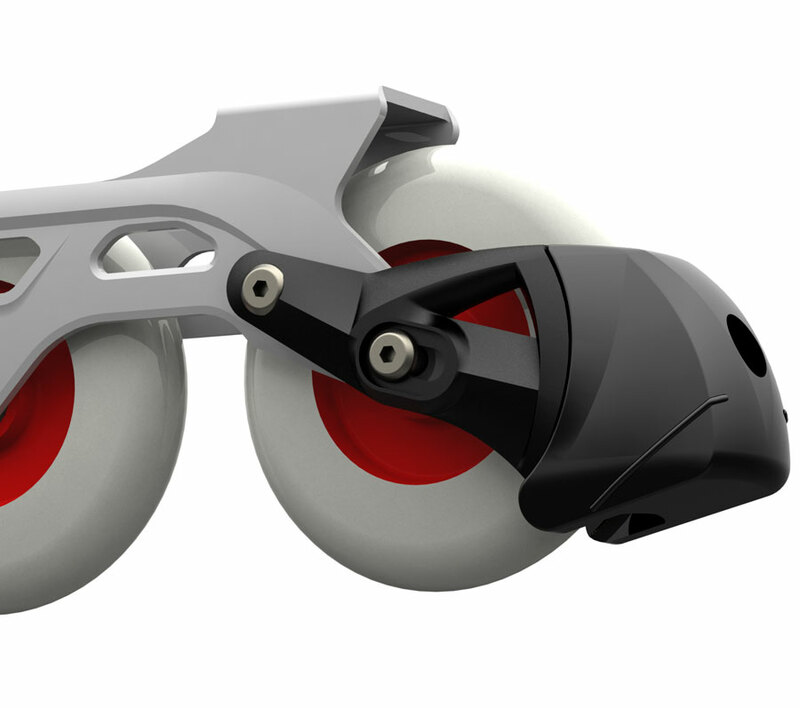 Bigger wheels not only last longer than small wheels, but also provide a more comfortable roll with less vibration. 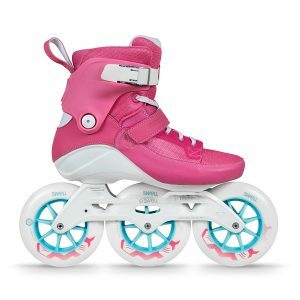 Experienced skaters chose Triskates because they can reach higher top speeds but at the same time Triskates are a better choice for beginners because they allow to skate over any surface and ground imperfection without problems, minimizing the risk of falls and improving the confidence. 3×100 mm wheels offer more control and faster acceleration. With smaller wheels the center of gravity is lower and the frames are shorter resulting in the most maneuverable and agile setup of the whole Powerslide SWELL collection, optimal for powerful urban skating and short intense sessions. It is also a great option for beginners or inexperienced skaters because the 100 mm still provide a more pleasant roll than traditional 4×80 mm wheels skates and less stress on the ankles than bigger wheel setups. 3×100 mm is our most conservative setup but it guarantees fun and performance at the same time. 3×110 mm wheels is probably the most popular 3 wheel setup with the best balance of frame length, height and speed, resulting in a great choice for any kind of training and environment, for short or long distances. 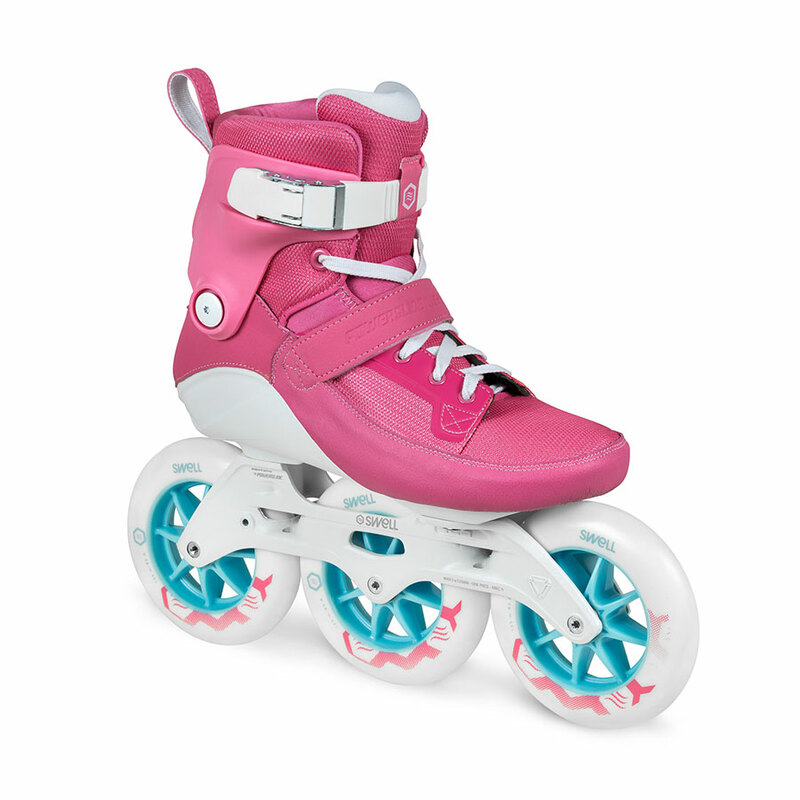 The short frames offer a very maneuverable and agile skating experience and a very smooth roll over any surface, with a lot of grip and fast acceleration and rebound. 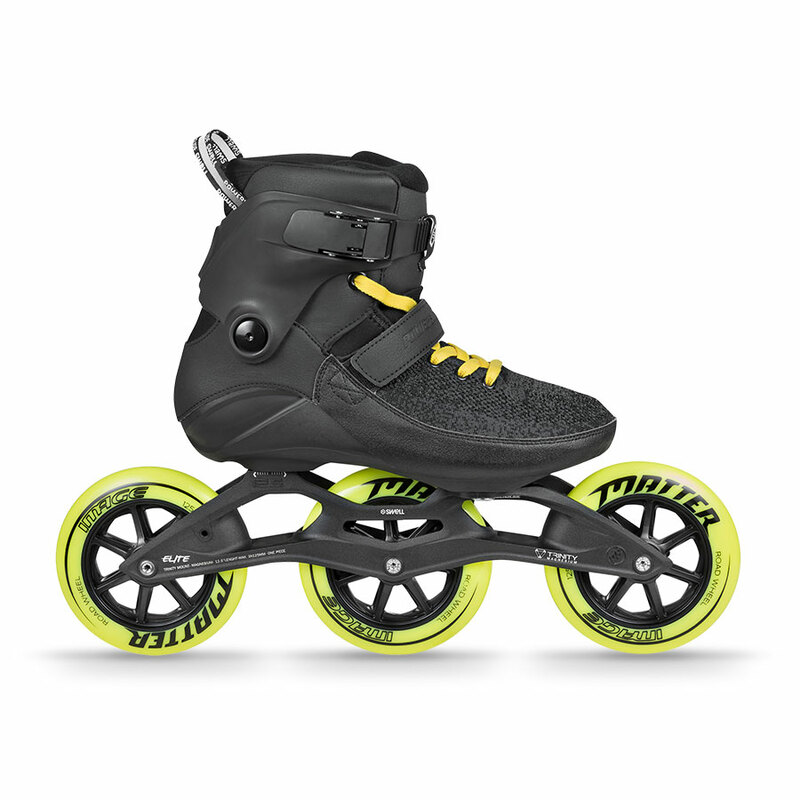 Doesn’t matter what you do in your skates, you can’t go wrong with 3×110 mm. The 3×125 mm wheel setup offers a fair balance of frame length and height and gives unparalleled speed. 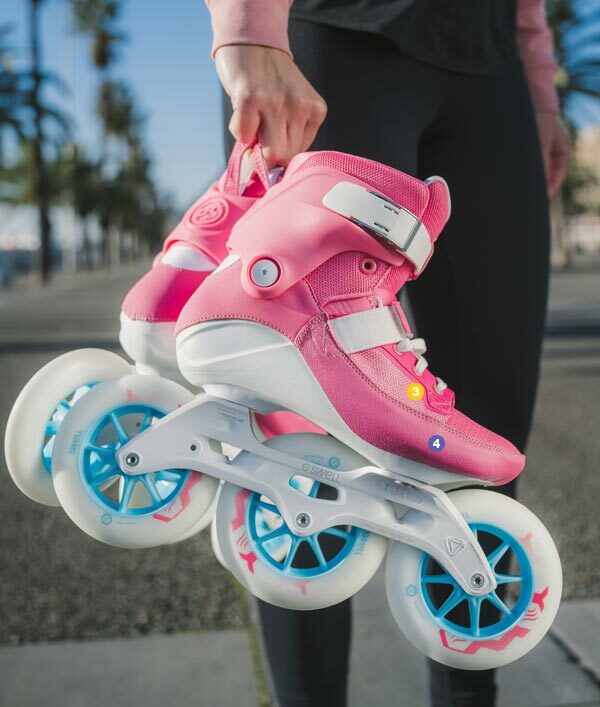 125 mm are the biggest wheels you can fit in inline skates but thanks to the very tight frame you are not higher than in a 4×100 mm wheels setup. 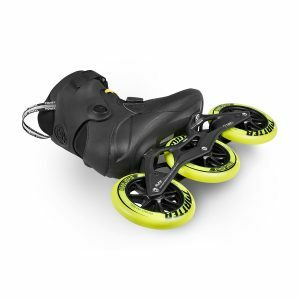 This fairly maneuverable and agile setup offers a great skating experience in any situation, but it really shines in long distance routes, maintaining your speed better than any other wheel size and providing unmatchable top speeds and the most cushion to roll over any surface. There is nothing close to a 3×125 mm setup, it guaranties tons of fun and once you get used to it, you will never go back to anything smaller! 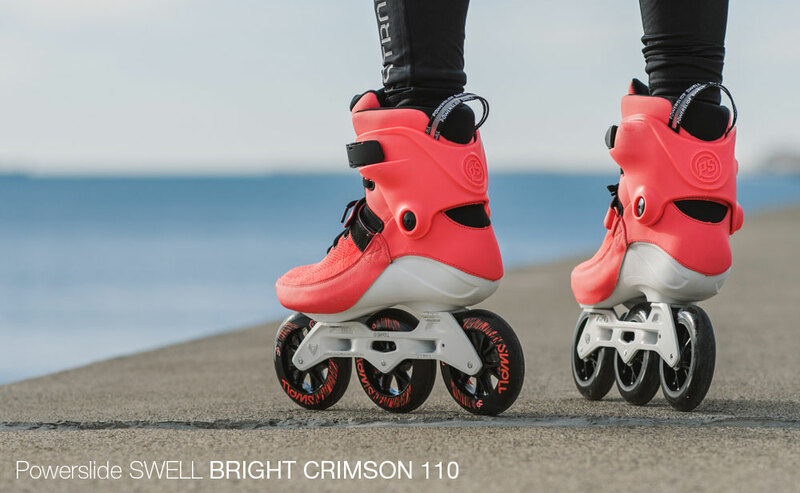 The Powerslide SWELL skates feature WCD freespin bearings lubricated with light grease. They have a strong and solid steel cage and 7 steel balls which are honed and finished to perfection to guarantee a smooth and nice roll. 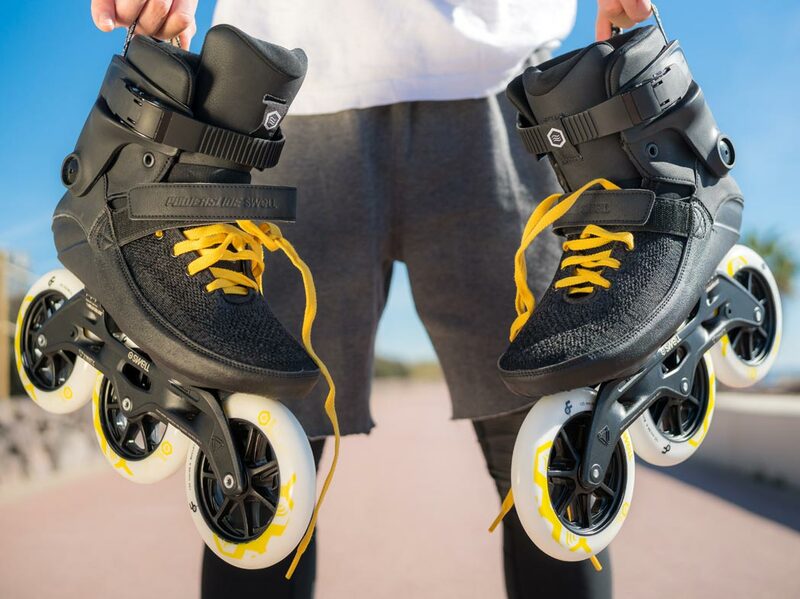 WCD is the bearing of choice of the fastest man of the planet on inline skates: Bart Swings, professional speed skater and multiple world champion. To extend the lifespan of your bearings always keep them clean and well lubricated. For further instructions watch the tutorials in our PowerslideTV channel or contact your local skateshop for additional help. 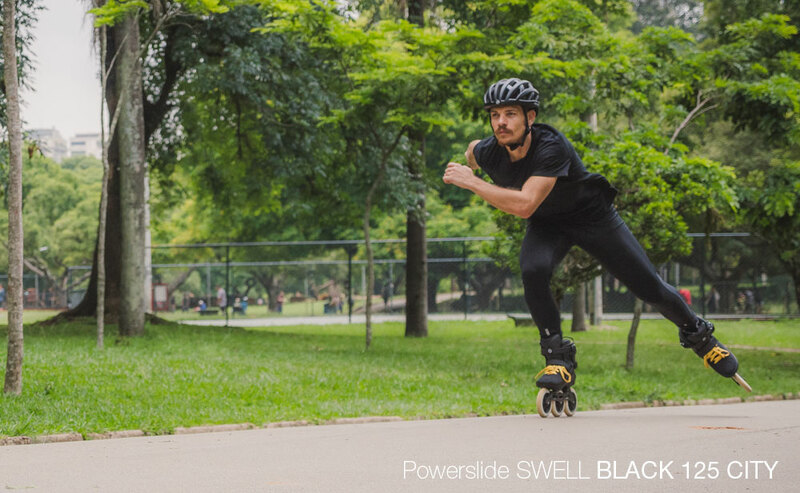 Powerslide SWELL Black 125 City, Black 125 Road, Bright Crimson 110 and Multicolor Flare 100 models feature WCD Abec 9 freespin bearings. 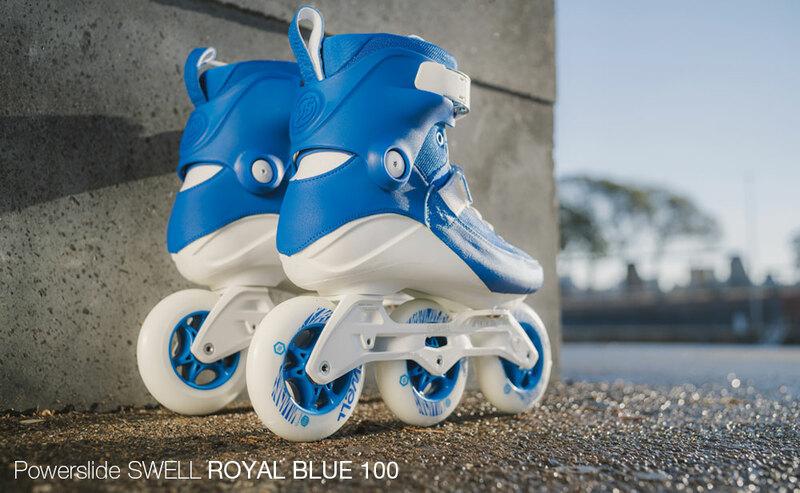 Powerslide SWELL Flamingo 125, Ultra White 110 and Royal Blue 100 models feature WCD ABEC 7 freespin bearings. The Height Adjustable Brake System (HABS) offers a lot of advantages over ordinary heel brakes. The braking surface has a bigger contact area, for a more controlled braking action and a shorter stopping distance. The height adjustment function is perfect to find the preferred personal braking position, lower or higher, with straight legs for more braking power or angled legs. Also once worn down the brake pad can be lowered to keep the best braking point for more safety and security. The removable HABS brake is for sure the best and most effective heel brake system on the market. Easy to mount to the frame and made out of the best materials available. Powerslide also offers replaceable brake pads. Until you achieve a solid stopping technique and feel fully comfortable and safe skating without a brake, Powerslide recommends to mount it to the frame and wear your brake at all times. If you have any questions on how to mount the brake, watch the tutorials on our PowerslideTV channel or contact your local skateshop for additional help. Go further, harder and repeat. The Powerslide SWELL skates help you perform your weekly training and still enjoy every single moment you are in your skates. 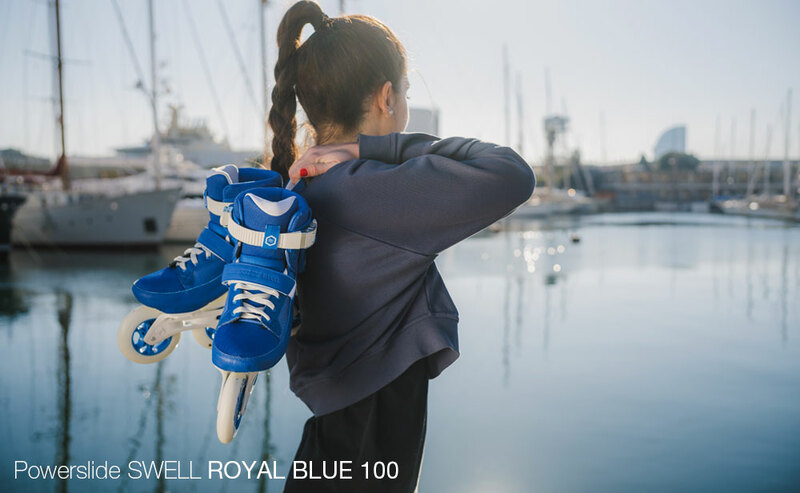 As with all things you wear, choosing your pair of skates is very personal and we offer a wide range of distinctive styles for everyone’s taste. The nice finish to detail, along with the rich and vivid colors round up the Powerslide SWELL collection. 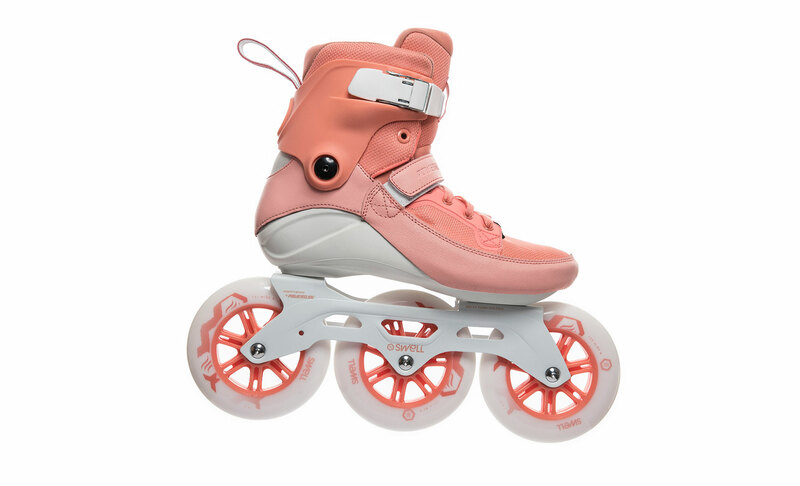 All the Powerslide SWELL Series 3 skates feel great from the very first moment you put them on thanks to the new shell with flex cuts and the RECALL fit, a 3-D anatomically shaped padding made out of a special memory foam, offering the same great comfort and performance day after day. Meet. Progress. Share. Be inspired.  Space to meet & learn other Powerslide SWELL Triskates lovers and be inspired by the finest skating fitness content. 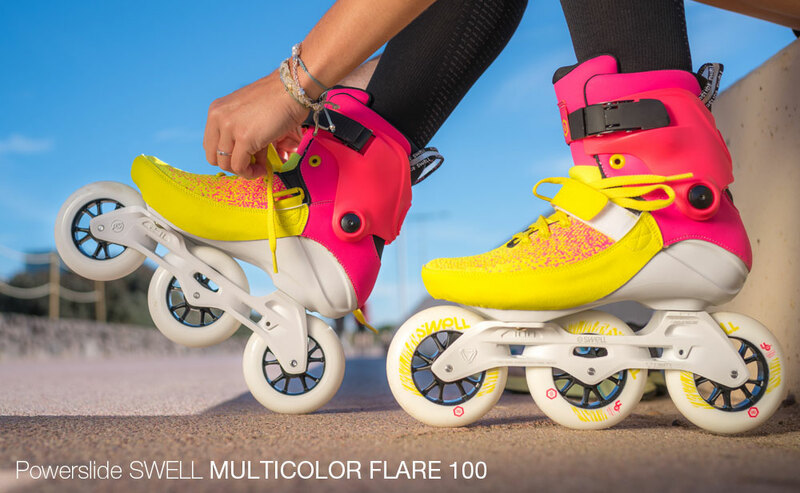 Follow our ROLLEROBICS channel to learn new routines and improve your workout on skates. Web Realization: DISNOTWORK for POWERSLIDE.